The German Shepherd has been a loyal service dog, both for police and rescue workers as well as for those with disabilities. These intelligent canines are known for their incredible loyalty and determination when helping their human companions. However, even this breed that has helped so many can be a very dangerous dog when they become aggressive through training or mistreatment. 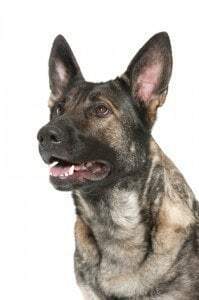 In many cases of German Shepherd bites or attacks, it is the owner, not the dog, that is to blame. German Shepherds have always been work dogs. The breed was standardized in the late 1800’s in Germany and was often used as a sheep herding dog. However, these dogs quickly became valued for their intelligence and loyalty, making them a perfect fit to accompany soldiers in the wars. After World War II, the popularity of this breed spread to the U.S., when many American soldiers brought these canines home with them. Since their beginning, German Shepherds have been highly trainable and used in many different services. Their independent thinking made them popular as guard dogs, blind service dogs and members of police canine units. Their agility, tenacity and loyalty have made them heroes, often loved by many who have owned or worked with them. Unfortunately, the same traits that have gained these dogs international and local acclaim are also the same traits that can make them dangerous. What can make a dog loved and revered can turn ugly when that same intelligence and loyalty is misused. Though German Shepherds are noble, beautiful dogs, in the wrong hands they can be vicious. Many may not realize that these dogs are one of the most dangerous dogs when it comes to dog attacks. German Shepherds are listed as one of the most deadly dogs in the U.S., with only Pit Bull Terriers and Rottweilers causing more fatalities. The Center for Disease Control reported 17 deaths from German Shepherds from 1979-1988, with another 15 deaths reported through 2013. These beautiful dogs can be trained to be aggressive and ruthless, just as the right owner could train them to help a blind person across the street. For those who are victims of a German Shepherd attack or bite, the owners of the dog may be held liable to pay medical bills, lost wages and other expenses. In many cases, the dog owner’s homeowner insurance may cover the majority of these expenses. Contact us for a free, no obligation consultation today.